City smog, rising sea levels, environmental and agricultural changes are all due to the burning of fossil fuels. Also, removing fossil fuels from the ground in the form of oil and gas drilling is harmful to the environment. Drilling creates noise pollution for complex habitats. It disrupts animal migrations. Oil spills are also a constant risk. It effects the health of animals and humans in a negative way. It damages organs such as the liver, kidney, spleen or brain. Cancer, immune system suppression, and reproductive failure are also consequences of oil spills. The construction that is needed for drilling effects the environment by causing vegetation to die. It increases erosion which destroys native vegetation and the area is then prone to invasive plants. ^ American Petroleum Institute. "Key Characteristics of Nonrenewable Resources". Retrieved 2010-02-21. ^ "World Uranium Mining". World Nuclear Association. Retrieved 2011-02-28. ^ "What is uranium? How does it work?". World Nuclear Association. Retrieved 2011-02-28. ^ "重庆云阳长江右岸现360万方滑坡险情-地方-人民网". People's Daily. Retrieved 2009-08-01. See also: "探访三峡库区云阳故陵滑坡险情". News.xinhuanet.com. Retrieved 2009-08-01. ^ Lin Yang (2007-10-12). "China's Three Gorges Dam Under Fire". Time. Retrieved 2009-03-28. 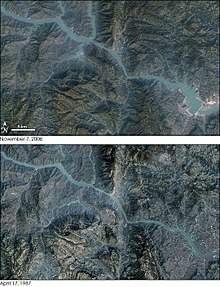 The giant Three Gorges Dam across China's Yangtze River has been mired in controversy ever since it was first proposed See also: Laris, Michael (1998-08-17). "Untamed Waterways Kill Thousands Yearly". Washington Post. Retrieved 2009-03-28. Officials now use the deadly history of the Yangtze, China's longest river, to justify the country's riskiest and most controversial infrastructure project – the enormous Three Gorges Dam. and Grant, Stan (2005-06-18). "Global Challenges: Ecological and Technological Advances Around the World". CNN. Retrieved 2009-03-28. China's engineering marvel is unleashing a torrent of criticism. [...] When it comes to global challenges, few are greater or more controversial than the construction of the massive Three Gorges Dam in Central China. and Gerin, Roseanne (2008-12-11). "Rolling on a River". Beijing Review. Retrieved 2009-03-28. ..the 180-billion yuan ($26.3 billion) Three Gorges Dam project has been highly contentious. ^ "Illegal, Unreported and Unregulated Fishing In Small-Scale Marine and Inland Capture Fisharies". Food and Agriculture Organization. Retrieved 2012-02-04. ^ "Global Trends in Sustainable Energy Investment 2007: Analysis of Trends and Issues in the Financing of Renewable Energy and Energy Efficiency in OECD and Developing Countries (PDF), p. 3" (PDF). United Nations Environment Programme. Retrieved 2014-03-04.